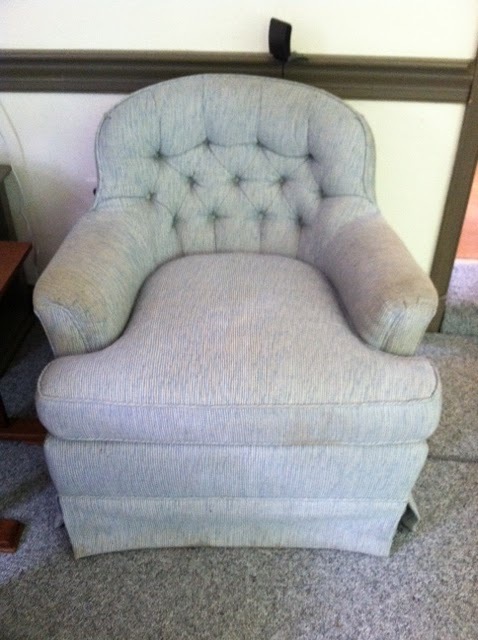 Remember the story of the old chair that we bought for the nursery? I was so happy that circumstances put this chair in my path at just the right time and for a great price. I knew its scale, tufted back and the fact that it rocked would be perfect for the nursery...and it is. 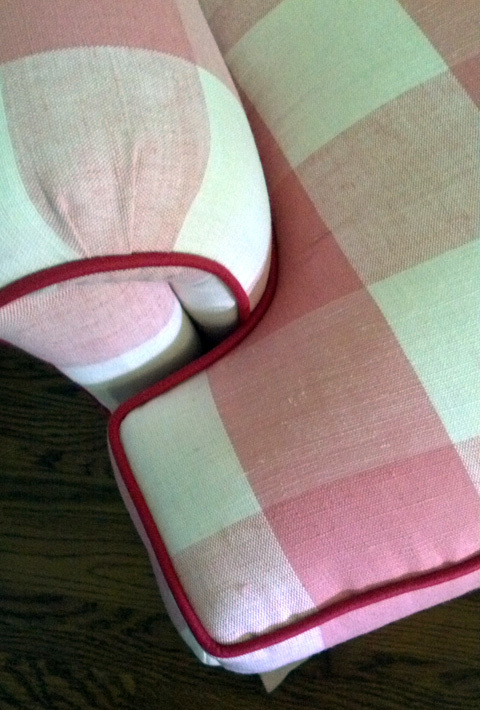 Since the moment I got it, I envisioned redoing the chair in a pink buffalo check and I never abandoned the idea, even through a couple of design schemes. And I got very lucky that once I decided to pull the trigger I came across the perfect fabric for only $5/yard during our beach trip this summer. Throw in some red fabric for piping and my favorite upholsterer Hakan and I have one fantastic little nursery chair on my hands! The chair looks completely bomb in the nursery and it's super comfy. Hakan of Simply Upholstery might be one of my favorite people on earth because he makes my upholstery visions come true...and always better than I expected. So one teensy regret? I didn't do the buttons on the back in red! DOH! I thought about it and decided not to for some crazy reason. Carter was a little skeptical about the red trim so maybe he scared me away from the buttons? Can I blame him for this? Totally not a big deal...the chair looks amazing...but the pop of little red buttons on the back would be killer. Thanks to my sister-in-law Joanna for Andi! And I picked up the cute pillow in the perfect shade of yellow at Target. Fabulous job!! It's amazing what a upholstery job can do to a piece. And I love the piping. Great little detail. Come on....you're not going to show us one little element of the nursery at a time are you.. she'll be nineteen before we get to view the whole thing..we can't wait to see the entire design. Just kidding... this chair is devine and would be 2,400 if you could find it at Petite Tresor or other upscale store. This is so ridiculously awesome! You are so talented. Your little girl is in for the best surprise when she realizes she has the most coolest/talented mom ever! This is just adorable! Lucky you and wee one to get to enjoy it... and thanks for the lead on upholsterer. My daughter lives in D.C. and we will file this away; actually, it was through her that I got to you! 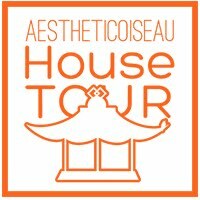 She works for NBM and was researching design blogs in D.C. area for a public program they are doing and sent me your link! And that is why I love blogging and social media!!! Love it! Can't wait to baby girl gets here! No you can't either!!!! Good luck! thinking of you!!! Tres Adorable. What a beautiful upholstery job. Red buttons would be cute, but it looks great as is. Great find. I could never have envisioned the "after" by seeing the "before." Good for you! It is perfectly gorgeous. Pink and red...my favorite color combo. How absolutely gorgeous! 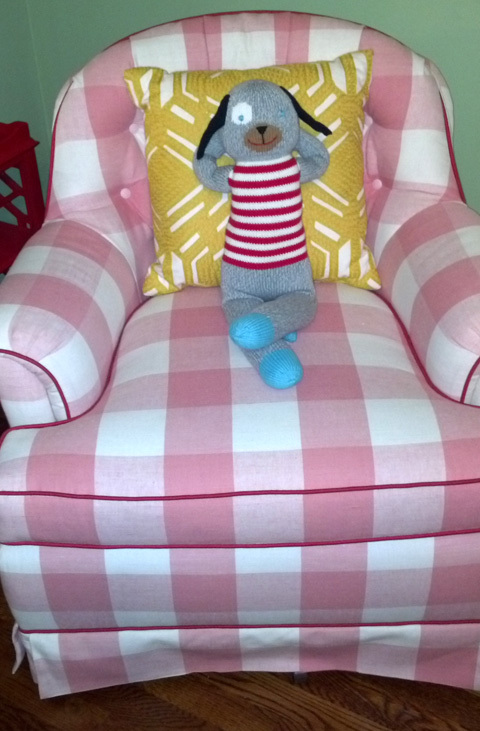 I love red and pink together and the chair turned out fabulous! Ok. So I live and breathe for a buffalo check. Especially a buffalo check with contrast piping. Hello. My lawwwwd. So adorable. Love the pink with red piping. I actually like prefer the buttons as they are too.